Several years ago we posted an unusual MCM that’s purpose was a mystery. It was clearly made by IBM and clearly high end. While researching another mystery IBM MCM both of their identities came to light. The original MCM is an emulation processor from a Cadence Palladium Emulator/Accelerator system. Here is a flipped (and very rough) die from a Palladium II. You can make out the very repeating design of the 768 boolean processors. but only handle boolean data, logic functions such as AND, OR, XOR, etc. Perhaps the most well known, is the boolean sub-processor that Intel built into the 8051, it excelled at bit manipulation. The same applies for the emulation processors in CoBALT. Each boolean processor has at its heart a LUT (Look Up Table), with 8-bits to encode the logic function (resulting in 256 possible logic function outputs) and the 3 gate inputs serving as an index into the LUT, as well as the associated control logic, networking logic, etc. A target design is compiled and emulated by the CoBALT system. The compiling is the tricky part, the entire design is broken down into 3-input logic gates, allowing the emulator to emulate any design. Each processor element can handle one logic function, or act as a memory cell (as many designs obviously include memory). The CoBALT had 65 processors per chip, and 65 chips per board, with a system supporting up to 8 boards. This 33,280 processor system could compile 2 Million gates/Hour. 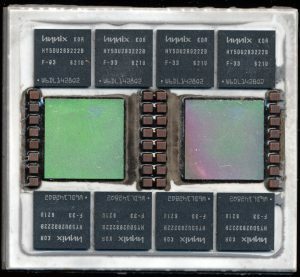 The CoBALT plus sped this up a bit and supported 16 boards, doubling capacity and added on board memory. 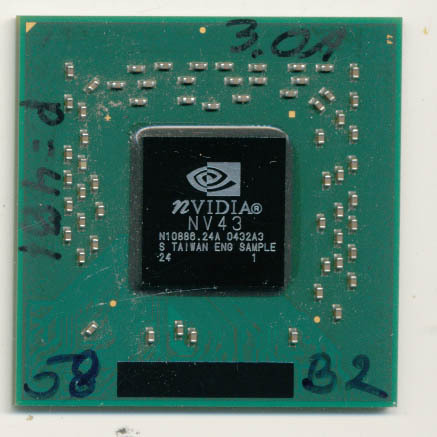 The NV43 is the code name for the Geforce 6600. It was released in August 2004 (abut the time this Engineering Sample was made) and could be clocked at up to 525MHz. 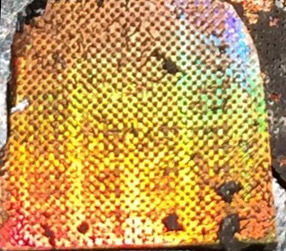 It was fab’d by TSMC on a 110nm process and contains 143 million transistors (about the same as a Pentium-M Dothan core). Over a year ago we wrote about the need for native support of ARM cored processors by Windows (and not just Windows mobile). Yesterday at the CES Microsoft officially announced it will be supporting ARM processors as well as ARM SoC’s in Windows 8, and demo’d several such systems. This is very important to the landscape of processors. Obviously software support will be initially lacking but this brings much needed competition to the PC market. 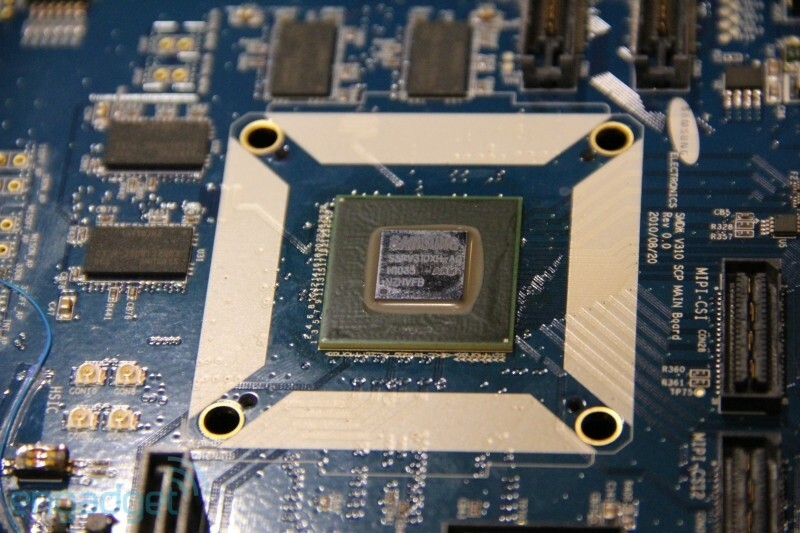 Intel and AMD have been competing with each other, and each other alone (with a few exceptions) for almost 10 years now. Bringing full fledged Windows to a new architecture is not unprecedented. Windows NT 4 ran on x86, MIPS, PowerPC as well as the Digital Alpha. Nvidia, already very talented in the GPU market, has been working on ARM processors for a couple years now with its Tegra line, so its not surprising that they have also announced development of a ARM based processor/GPU targeted for the desktop known as Project Denver. VIA is also adding some more competition with the release of their first dual core processor, the Nano X2, based on the Isaiah architecture. While not known for brute force, the Nano is known for its low heat and power sipping capabilities. Current smartphones have an impressive amount of processing power, and its getting better yet. Samsung’s new Orion chip has now been spotted running in the wild. This is one of the first of the next generation of mobile Application Processors. In 2008 a smart phone would have a ARM11 class processor running at around 500MHz. The original iPhone, and the iPhone 3G used one made by Samsung running at 412MHz. The first Android phone (the Google G1/HTC Dream) used a 528MHz Qualcomm MSM7201A ARM11 processor. The original Nvidia Tegra CPUs also fall into this class. We’ll consider this the first generation of the TRUE smart phones as before the iPhone, smart phones were of limited use, and rarely had things likely fully working internet browsing etc. The second generation of smart phones significantly increased in processing power. These are the phones that we use today. The majority of these run on some version of the ARM Cortex-A8 processor. These processors are single core 600MHz-1.3GHz devices. Perhaps the best known are the Apple A4 (Samsung Hummingbird), the Qualcomm Snapdragon (really a custom ARM core called the Scorpion similar to the Cortex-A8 crossed with a Cortex-A9), and the TI OMAP3 series. Second generation Application Processors also have brought some pretty powerful graphics to phones. These are integrated onto the same die as the Cortex-A8 and usually are PowerVR (Apple/Samsung and TI), Adreno (Qualcomm from ATI), or Mali (ARMs own GPU) based. The smart phones of 2011 will begin using the third generation of Application Processors. These are defined by being based on the ARM Cortex-A9, a faster and more efficient ARM core, as well as typically being a dual core (or better) device. The TI OMAP4 series fits this description. 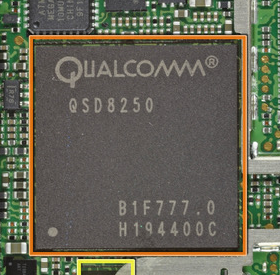 Qualcomm will continue with the Snapdragon line, but bring it to a dual-core 1.5GHz chip. Apple is an unknown, but will likely up the speed of the A4, or add a core to it. Samsung;’s Orion is a dual-core 1GHz A9 with a quad core Mali GPU. 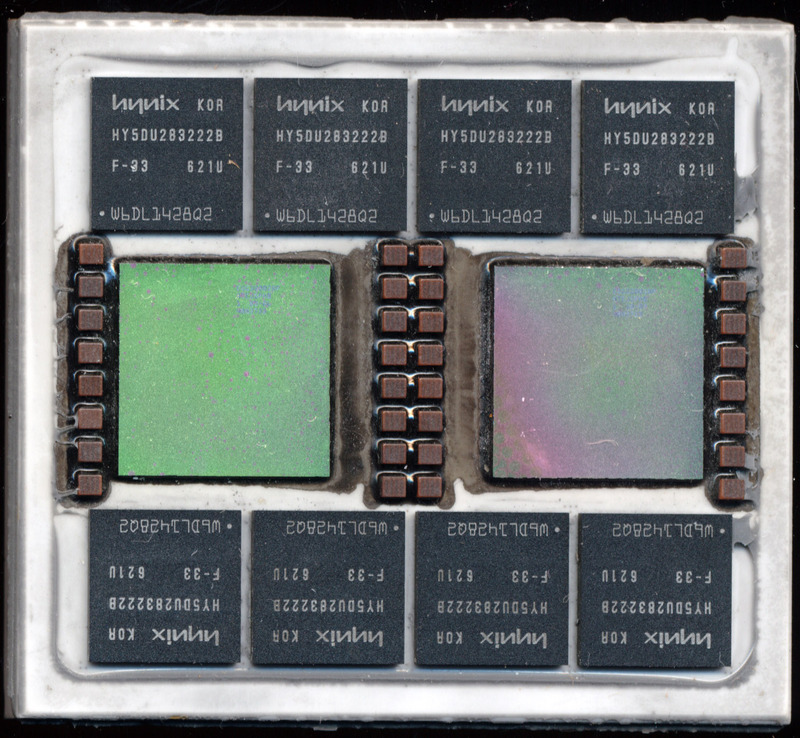 It also packs 32KB of L1 cache per core and a full 1MB of L2 cache. 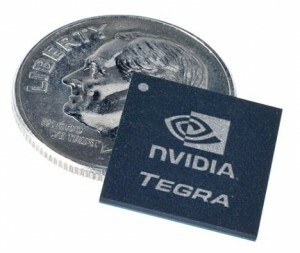 Nvidia has the Tegra 250 already, which powers a handful of devices such as the Zune HD. These processors will handily run full 1080p video, as well as drive external displays. Your phone will soon be able to play movies on your TV. What will the future bring? 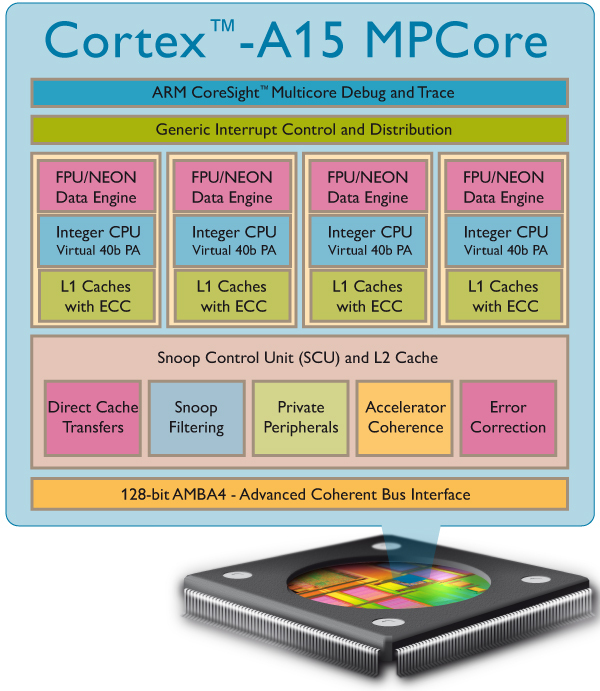 ARM Cortex-A15, the Eagle, is a 2.5GHz quad core. Hopefully it can run without depleting our batteries in an hour.